When it comes to planning your next trip, you are mostly reliant on your travel agents or the Internet to find out the best possible options. However, have you even wondered how would you feel, if there will be an AI powered program, which will contain almost all the information you require, and will help you at every stage of the planning. Technology has a long history of spurring innovation in the field of travel. Starting from the extremely helpful digital maps or the portals which help us to book our flights or trains more conveniently, the advent of travel tech has certainly made the life of the travelers better. Just like a host of other areas, artificial intelligence is eventually enhancing the travel industry as well. AI is bringing in a plenty of new conveniences as well as the capabilities along with it. Starting from personalized suggestions to booking to digital concierge service, AI is doing a lot to make the process of planning a trip a lot easier and less hectic. Artificial Intelligence is basically responsible for doing a great impact in the field of travel planning. 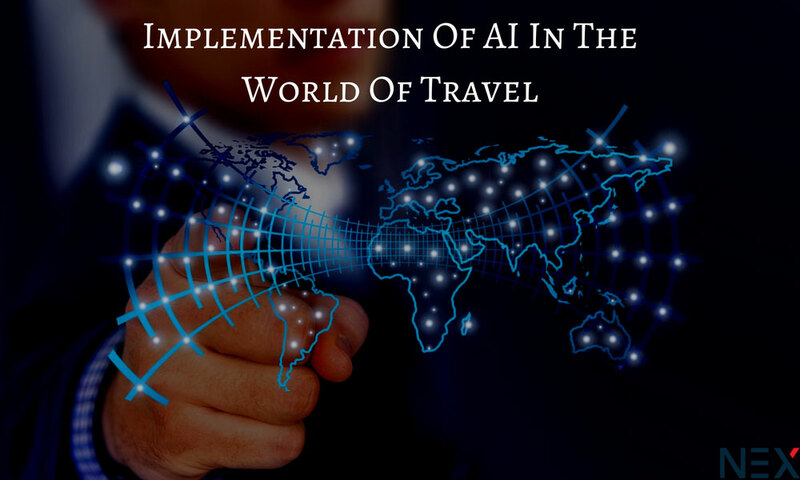 Be it the travel agencies or the airlines, Software development firms are using the best form of AI technology in order to automate the complete travel planning and booking process. Some of the AI programs will only require you to answer a few questions without any involvement of any sort of human travel agent at all. However, if you specifically require a human travel agent, then, in that case, you would be able to get one. However, the AI-powered applications will keep making intelligent suggestions as per the context to help the travelers complete the travel booking process quicker. We already know that AI is already providing consumers personalized suggestions, which are helping them in a great way. Some of the mobile applications make the complete travel planning and booking process a cakewalk. All we have to do is just simply inform the mobile app where we would like to go, and the AI powered program will take care of the rest! We have the option to smartly book suggestions, plan a travel itinerary which the traveler may update anytime. Also, there is an option to store all the necessary docs as well as the required confirmations in one place safely. Why are travelers loving the new chatbots? Chatbots are creating a rage in the travel industry and the reasons are many. The bots are helping the travelers in a host of interesting ways. Though, initially, the chatbots may only permit you to only book trains, flights, cars etc. However, later on, they are evolved, and they contain more capabilities, which further help you to prepare the complete trip. Now a days, these chatbots are very much target audience centric. They are designed uniquely, and are personalized for a specific group of people if needed as well. Some of the chatbots even have the features like the option to create multi-person itineraries, and such features make such apps a lot better than the rest. It is believed that proper utilization of chatbots can speed up the reservation process. Especially, when it comes to searching for the perfect fit for a variety of people. Chatbots for almost every kinds of thing, starting from weather updates to even fitness advice are present in the market. This is because the usage and the need of smartphone messaging applications steered by artificial intelligence is growing at a rapid speed. Therefore, travel industries, in order to perform better, and match up to the expectations of their audience have to come with chatbots. Chatbots are helping you in a plenty of ways. They not only offer you relevant suggestions, but they also help a lot of your time which can be wasted in looking for the best options for you. At the same time, the travel planning and booking process is a lot more simplified now. Therefore, many travel firms have adopted the chatbot technology already to not just attract the travelers, and to offer them a great experience.